Just when we thought our New York touring couldn’t get better than the 2018 version, 2019 comes along, and brings with it another installment of the Robert Lepage Ring, the first Met Ring since 2013. A cast of magnificent Wagnerians, led by the thrilling Christine Goerke making her Met role debut as Brünnhilde, will be led by Philippe Jordan, one of the finest and most dynamic conductors on the planet. Robert Lepage’s breathtaking production, which faithfully presents every detail of Wagner’s immortal libretto, will be enjoyed from Orchestra Premium seats, as will performances of Rigoletto (May 1) and Dialogues des Carmélites (May 3). Our hotel will be the luxurious, stylish, spacious and perfectly-located Firmdale Whitby Hotel, at 56th and 5th, and our guided touring will make our “downtime” truly special, with tours of the Whitney, the Morgan Library, The Frick and more. And, as always, we will include full breakfast plus one other superb meal each day. Upon arrival at your NYC-area airport, you are met and transferred to the ideally-located Firmdale Whitby Hotel. The design is elegant, warm and wistful, the rooms are large and superbly appointed, and the staff is charming, attentive and professional. This is the sister hotel to the Firmdale Covent Garden in London, one of our favourite hotels anywhere. Tonight we meet for a Welcome Dinner at Tavern on the Green. Following breakfast (included each day), we enjoy a tour of your Director Tana Ross’s favourite spots in the city, including the Morgan Library. A complex of buildings in the heart of New York City, The Morgan Library & Museum began as the private library of financier Pierpont Morgan (1837–1913), one of the preeminent collectors and cultural benefactors in the United States. As early as 1890, Morgan had begun to assemble a collection of illuminated, literary, and historical manuscripts, early printed books, and old master drawings and prints. Built between 1902 and 1906 at Madison Avenue and 36th Street by Charles McKim, the library is an Italian Renaissance-style palazzo with three magnificent rooms epitomizing America’s Age of Elegance. Lunch is included at Keen’s Steak House (1885). This evening, our Ring journey begins at The Met with Das Rheingold under the baton of Philippe Jordan (7:30pm curtain). Following breakfast, we gather in the lobby and depart for a walk on the High Line, a 1.45-mile-long elevated linear park, greenway and rail trail created on a former New York Central Railroad spur on the west side of Manhattan. The High Line ends at the Whitney Museum, where we enjoy private tour. The Whitney’s collection includes over 22,000 works created by more than 3,000 artists in the United States during the 20th and 21st centuries. The Whitney has deep holdings of the work of certain key artists, spanning their careers and the mediums in which they worked, including Alexander Calder, Mabel Dwight, Jasper Johns, Glenn Ligon, Brice Marden, Reginald Marsh, Agnes Martin, Georgia O’Keeffe, Claes Oldenburg, Ed Ruscha, Cindy Sherman, Lorna Simpson, and David Wojnarowicz. This evening we return to The Met for Die Walküre (6pm). Dinner is included at The Grand Tier. Late morning we depart for a highlights tour of The Frick Collection. The Frick carries masterpieces of European painting, major works of sculpture (among them one of the finest groups of small bronzes in the world), superb 18th-century French porcelains, Old Master and 19th-century works on paper, Limoges enamels, and other works of remarkable quality. 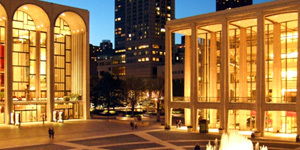 Optional: those who wish can partake in a behind-the-scenes tour of Lincoln Center. Dinner included at The Atlantic Grill before Verdi’s Rigoletto at The Met (7:30pm). Enjoy the day at leisure in New York. This evening, we transfer to the Met for Siegfried (6pm). Dinner is included at The Grand Tier. This morning we offer a tour to the Brooklyn Botanic Garden, founded more than a century ago. Today, the Garden represents the very best in urban gardening and horticultural display. This evening we dine at Lincoln Ristorante before the season premiere of Dialogues des Carmélites at The Met (7:30pm). Gather in the lobby and depart by coach for a private tour of The Cloisters, the branch of the Metropolitan Museum devoted to the art and architecture of medieval Europe. Renowned for its architectural sculpture, The Cloisters also rewards visitors with exquisite illuminated manuscripts, stained glass, metalwork, enamels, ivories, and tapestries. This evening, our Ring journey concludes with Götterdämmerung (6pm). Dinner is included once again at the Grand Tier. Airport transfers are included and will be arranged on-site. Flights are not included in tour pricing. Ideally, return flights should be booked to arrive at JFK or Newark early afternoon on April 28 with departure on the morning of May 5. Please note that LaGuardia Airport is under extensive construction until at least 2021, and is not recommended due to difficulty with transfer connections.